Display your beautiful flatware instead of keeping it in a drawer and save that precious space. 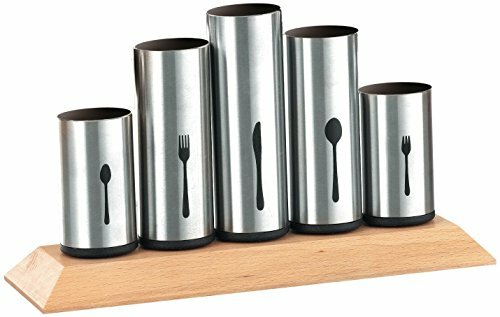 Made of 18/8 Stainless Steel with a rubber wood base, this five slotted, upright organizer has a flat stainless steel base with a brushed finish that could go into any kitchen. Keep those utensils handy. Our caddy holds up to 12 sets, so whether you like to have dinner parties or have a big family, it'll be practical in any situation. Durable and easy to clean with a cloth. The holders are fixed to the wooden base and are deep enough so they will not tip over. Five separately labelled cylinders for your flatware. Use indoors, outdoors, in a cafe for customers, work cafeteria, or work kitchen. Add a nice touch to your local meal spot. Perfect for housewarming, holiday, birthday, or wedding presents. Not intended for use in dishwasher. Wipe clean with wet cloth. Perfect for keeping your flatware neatly organized. If you have any questions about this product by Bruntmor, contact us by completing and submitting the form below. If you are looking for a specif part number, please include it with your message.